Once you know how to make fresh pasta, there are myriad ways you can put your knowledge to delicious use. One of the most lovely types of fresh pasta are the ever-popular ravioli, which, as you probably know, are a kind of stuffed pasta, typically square with fluted edges. The fillings vary, but one of the most classic is a mixture of equal parts blanched swiss chard (spinach would also do nicely) and ricotta, seasoned with Parmesan cheese, salt, pepper and a pinch of nutmeg, to which an egg or two can be added as a binder, for a firmer texture. Whiz the filling ingredients together in a food processor, using the pulse function to avoid over-processing, until the spinach or chard is well chopped but the mixture is not yet entirely uniform. The green of the chard and the white of the ricotta should remain distinguishable. Cooking time will vary quite a bit depending, among other things, on the type of flour you use, the thickness of the pasta sheets and how long the ravioli has been drying before cooking. It should not take more than a few minutes, however, in any case. The best way to know when the ravioli are done is simply to test them. Remember to test the thickest part of the ravioli–the double thickness of pasta around the filling. One useful tip from the Rouxbe Online Cooking School: to avoid cutting into a raviolo, you can save some of the pasta trimmings (making sure it includes a double layering of pasta) and throw a piece into the water to cook with the ravioli. Fish that piece out of the water to test doneness. Then add additional layers of ravioli, condiment and cheese, repeating until you have used up the ravioli, and serve immediately. There are a number of possible variations in both ingredients and technique. The spinach-and-ricotta filling is, as I said, a classic, but equally popular, especially in southern Italy, is a pure cheese filling made with ricotta, mozzarella, parmesan, chopped parsley and egg. (Angelina’s sister, my great-aunt, who we all called Zi’ Zi’, was the family ravioli master, and her ravioli had this cheese filling.) In the cooler months, ravioli are often filled with zucca (Italian pumpkin). Ravioli can also be made with meat fillings, of course. and even, albeit less commonly, fish. The pasta for ravioli is generally made with farina 00, but the pasta for commercial ravioli will often be made, in whole or in part, with semolina flour, which makes the ravioli much firmer than home-made, and requires a longer cooking time. The usual 1 egg to 100g of flour ratio applies, but because it is stuffed, the pasta goes twice as far, so that 2 eggs and 200g of flour should make enough pasta for 4 (rather than the usual 2) people. At least one source suggests lowering the egg-to-pasta ratio (eg, 6 eggs for 1 kilo of flour) for delicate fillings (those other than meat) and using water to make for a softer, more pliable dough. And just last night, I spoke to some foodie friends who suggested adding white wine to the dough, to the same effect. 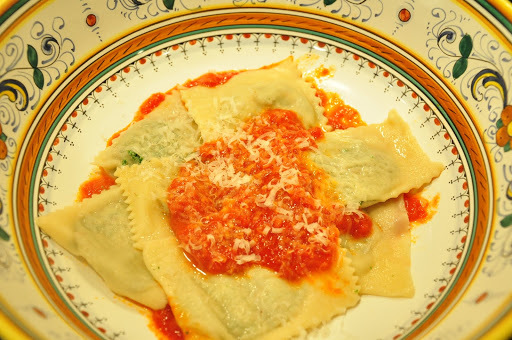 To sauce these ravioli, I would recommend a basic sugo di pomodoro or light tomato sauce, made from a soffritto of oil and garlic, tomatoes and a few basil leaves, simmered for about 20 minutes and then passed through a food mill. Or make the soffritto with chopped onion, carrot and celery. This sauce is often called pomarola, or ‘pummarola‘ in Neapolitan dialect. In the US, this kind of basic tomato sauce is often called a marinara sauce. Also very common is to simply dress the ravioli with butter melted with fresh sage leaves and seasoned with a bit of salt. Both are lovely. Simple butter and cheese would also be nice. Stuffed pastas (especially tortellini) are sometimes sauced with cream, but I wouldn’t recommend it for this dish. 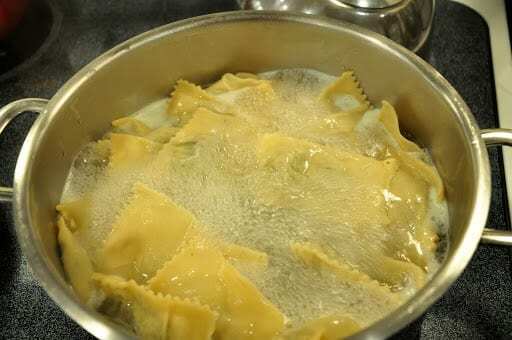 If you like, you can also add the ravioli to the saucepan and allow it to absorb the flavors of the sauce, as you often do with other pasta dishes. I do like the above in-the-bowl method for ravioli, especially when made with thinly rolled soft-wheat pasta, which can be a bit too delicate to stand up to both boiling in water and simmering in sauce. Besides being a filling for ravioli, the ricotta and greens mixture, mixed with a bit of flour, can be made into gnocchi known variously as gnocchi di ricotta e spinaci, gnocchi verdi, gnudi, gnocchi nudi or malfatti. Ravioli have been a part of Italian cooking for a long time. According to Wikipedia, the earliest mention of ravioli appear in the writings of Francesco di Marco, a merchant of Prato in the 14th century. 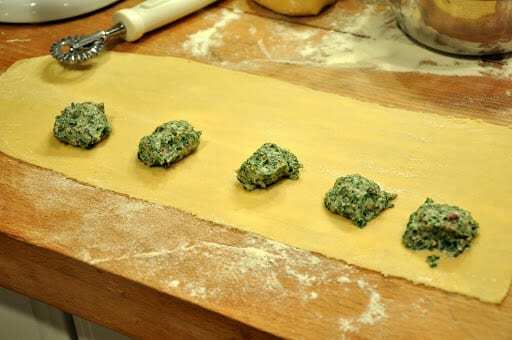 In the mid-14th century Venetian manuscript Libro per cuoco offers ravioli very similar to these, filled with green herbs blanched and minced, mixed with beaten egg and fresh cheese, simmered in broth. In Rome, ravioli were already well-known when Bartomoleo Scappi served them with boiled chicken to the papal conclave of 1549. I recently purchased, by the way, Scappi’s 1570 masterwork known as his Opera, subtitled L’arte et prudenza d’un maestro cuoco or The Art and Craft of a Master Cook. It actually contains a rather lengthy description of the conclave (which took place after the funeral of Pope Paul III) starting with the funeral mass and focusing at length on the logistics of serving the cardinals within the conclave. Oddly, though, Scappi says very little about the actually food served. The world of stuffed pastas is incredibly diverse and the nomenclature can sometimes be confusing. The quintessential ravioli are square with fluted edges. But the term “ravioli” is sometimes used to mean stuffed pasta generally, so you can come across round stuffed pasta going by the name of ravioli. And then there are agnolotti, the Piedmontese stuffed pasta which are also square with a meat filling. And the name tortelli, which normally refers to round and folded stuffed pasta, a sort of older sibling of tortellini, is sometimes also used to describe what would otherwise might be called ravioli… For more information on stuffed pasta terms, ravioli.it provides an interesting discussion (in Italian only). Yummy! Ravioli are my favorite but I never learned to prepare them at home. Can’t wait to prepare your recipe. By the way, they make mezzelune (half moons) filled with braised meat in Piemonte. They're definitely worth a try–the recipe is on the site. I remember my mother making ravioli. She would roll out the dough and would use a tea cup to cut the pasta and then fold them over into “half-moons”. As a child, the thought of square ravioli seemed, well, “square” to me and a filling other than Mama's cheese, egg, and parsley mixture was, in my father's words, “americano style”. He had a few choice other words for things like Chef Boyardee canned ravioli, as you might well imagine! These look wonderful, Frank. I haven't made homemade ravioli in a long time, but after reading your post, I'll be dusting off my pasta machine and cranking out some dough. Terrific recipes and posts! Many thanks, Laura. I'm honored by such flattering words from an expert ravioli maker! As a matter of fact, I do also make pasta with the matterello on occasion–that's the way nonna Angelina did it in the old days–and I've been thinking of posting on that as well one of these days. But I'll need someone to take my picture while I work! 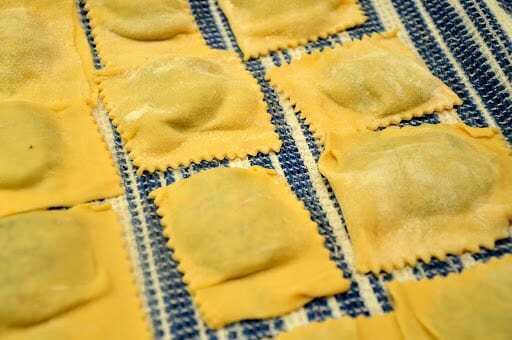 Really nice post on ravioli (and also your pasta making post.) Very well done. You would probably enjoy some day learning to make pasta with a big rolling pin, too. But you've got it totally down using the machine. I have got to make this, I can't believe I never have! Ciao Frank, After many years of saying I'm going to make homemade Pasta, I will do this today. Thank you so much for your inspiring and informative posts. I could just inhale all of your sidebits of info all day long! You have such an inviting personality in your writing…Bravo! Thanks, everyone, for the lovely comments. Glad you're enjoying the site. And, Diana, yes, of course, I'd be honored to be on your blog role! What a beautiful post. I alway's enjoy your recipes, pics, and writing! Is it okay to add you to my websites blogroll? I'm still working on it but would love to add your site! Congrats on being on the Top9 on Foodbuzz, well deserved! Mmmmm, I've been planning to make them for some weeks already and I didn't seem to find the right time yet! Looks wonderful and again, I love your crockery! Wonderful ravioli! I've never had them with swiss chard. How interesting. I'd love to try it! I love ravioli, but do not have a pasta machine…I would love to try all the variations. I had pumpkin filled ravioli at an Italian restaurant in Chicago last year and it was divine–had a very simple brown butter sauce as I recall. I will try this out 🙂 such a lovely dish. Another beautiful post! I am another one who finds ravioli daunting, but now I think I will try it one day…. soon I hope! I have a pasta roller with a ravioli attachment that I haven't ever used. The pasta itself is intimidating enough! But your recipe looks pretty do-able and very delicious.